It’s a good time to get into Far Cry. The series has constantly been growing over the years, and many consider Far Cry 5 and its standalone expansion, Far Cry New Dawn, to be among the best the series has to offer. But to really understand and appreciate the present, sometimes you have to head back into the past. Fortunately for PlayStation Classics fans, that is pretty easy. While the first game was a PC exclusive, in 2014 we received Far Cry Classic for the PS3. 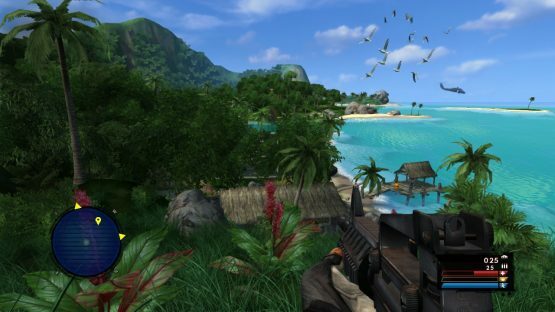 Far Cry Classic introduced a number of staples to what would become a series. 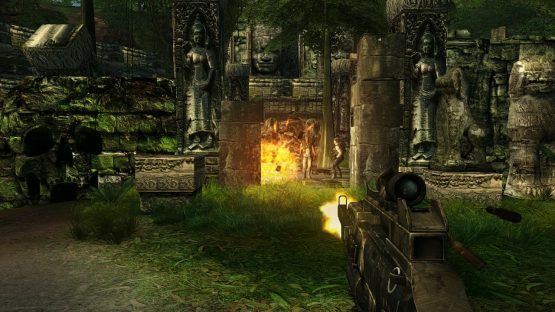 Across the series, players find themselves in the shoes of some sort of mercenary (though not in the case of Far Cry 3). It is usually a person who has extensive training and knows how to handle themselves in a fight, but isn’t bound by normal laws. They are placed somewhere totally unfamiliar, often a land that is foreign and exciting. Not only is there some sort of villain—like a cartel boss, mad scientist, or terrorist—and their underlings, but also animals or people who live in the area might not be welcoming. In this installment, people follow Jack Carver. He was hired as a bodyguard and guide of sorts for Valerie Constantine, a journalist investigating a deranged scientist named Krieger. They get separated and stranded on Krieger’s island, where the bad guy is conducting all sorts of unethical science, resulting in dangerous experiments. You have to find Val, discover what is going on, and stop it using all the gunplay and other violent and daredevil skills you expect from a Far Cry protagonist. Normally by this part of the PlayStation Classics installment, I start talking about gameplay or what makes an entry so unique. Except you all have a pretty good idea of what Far Cry is about. So instead, we’re going to talk about the journey this installment took. The first Far Cry was a PC exclusive, as I mentioned earlier. This was a big deal for Crytek, who we now all known for the CryEngine, Crysis, and Far Cry itself. It was a starting point for the company, but also provided an opportunity to set standards within the FPS genre and creating game engines. 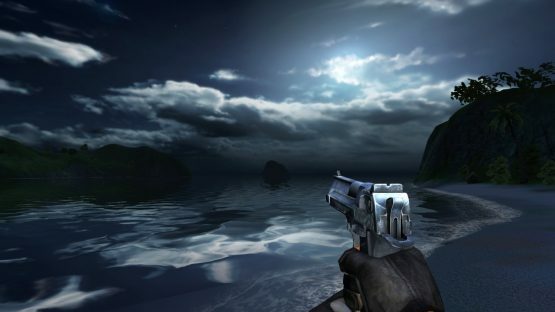 (Versions of CryEngine are still used today, with CryEngine V being the latest.) It wasn’t quite an open world game in the way we know it now, but wasn’t totally linear, offered players multiple ways to reach places, and even had some outdoor situations where you could resolve things how you liked. Now, it didn’t come to consoles as-is. Consoles weren’t powerful enough to handle its environments. Instead, Far Cry Instincts was when Ubisoft took over. Initially, in 2004, the company announced it would be developing and releasing a port that was more linear and made it possible for the game to work on consoles. In fact, this version was originally supposed to be on the GameCube, PlayStation 2, and Xbox. However, that didn’t happen and the new variation (and its sequel, Far Cry Instincts: Evolution, and Xbox 360 remaster, Far Cry Instincts: Predator) didn’t end up coming to any non-Microsoft platforms. It was only in 2014 that PlayStation fans had the chance to play this original version of Far Cry. Ubisoft announced the HD remake in 2013, then brought it to the PlayStation 3 and Xbox 360 the following year. It is in HD, has been rebalanced, has a new HUD, and includes trophies. Think of Far Cry Classic as an opportunity. It isn’t often that the first installment in a series that turned 15 in 2019 is easily accessible. But here it is! You can play it! It looks better than ever and has some modern conveniences. Plus, you can test it out first with a timed free trial, before going ahead and spending $9.99 on the whole thing.